American Mural Project founder and artistic director Ellen Griesedieck will receive the Connecticut Art Education Association (CAEA) 2019 Distinguished Service to the Profession award. One of seven arts professionals being honored, Griesedieck will receive the award at the CAEA annual awards dinner, April 28 at the Country Club of Farmington, where she will be recognized for her outstanding achievement and contributions to the field of art education. Click here to read the full article. Pilobolus performs special show at the Warner Theater. ASAP!’s Ultimate Collaboration with Pilobolus and the Winsted-based American Mural Project was featured, along with the Multi-Generational Community Dance Project. Click here for the full article and photos by Lara Green-Kazlauskas. 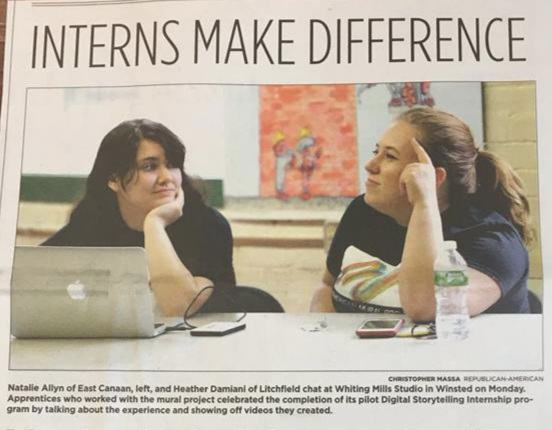 Winsted’s American Mural Project reaching toward its goal. Click here for the full story. The first panel of the American Mural Project is up. Early Thursday afternoon, project founder Ellen Griesedieck and five helpers carried the roughly 10-foot-tall aluminum honeycomb panel from one end of the former factory building to the other. They hoisted it 6 feet off the ground and secured it with bolts. Click here to read more. 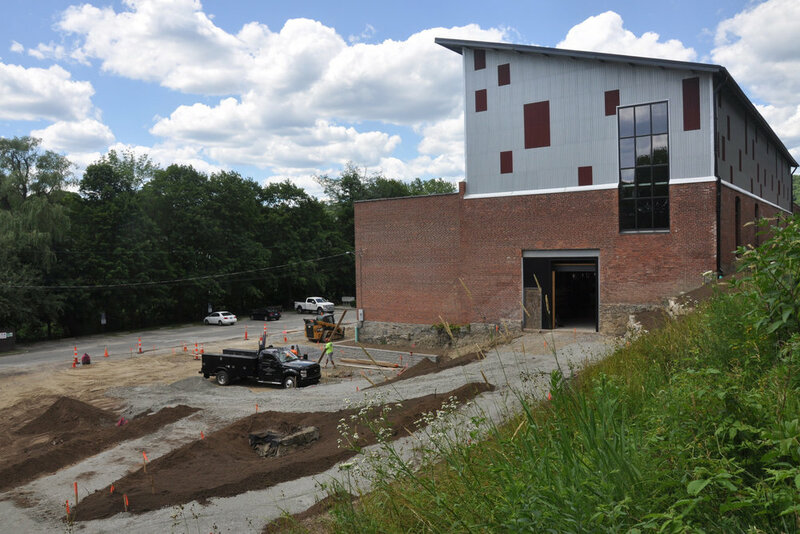 The renovation of the old mill that will become home to the American Mural Project is nearly completed. Click here to read the full article. Even Amy Wynn, the American Mural Project's first executive director, struggles a bit in explaining what the project is. But give her a couple of minutes and she is able to slowly put words together that at least provide a basic understanding of its intent. Click here to read the full article. Artistic accomplishment and social awareness are blended together in the nearly completed American Mural Project. Read the full article here. There’s a lot to like about Winsted, and when it’s finished, the American Mural Project is going to be in a class by itself as a city showplace. Not yet completed, it already generates an inner excitement. Click here to read the full article. Amy Wynn, current executive director of the Northwest Connecticut Arts Council will soon be joining AMP as the first executive director! Ann Nyberg interviews Ellen on the Nyberg show. Watch the video here. 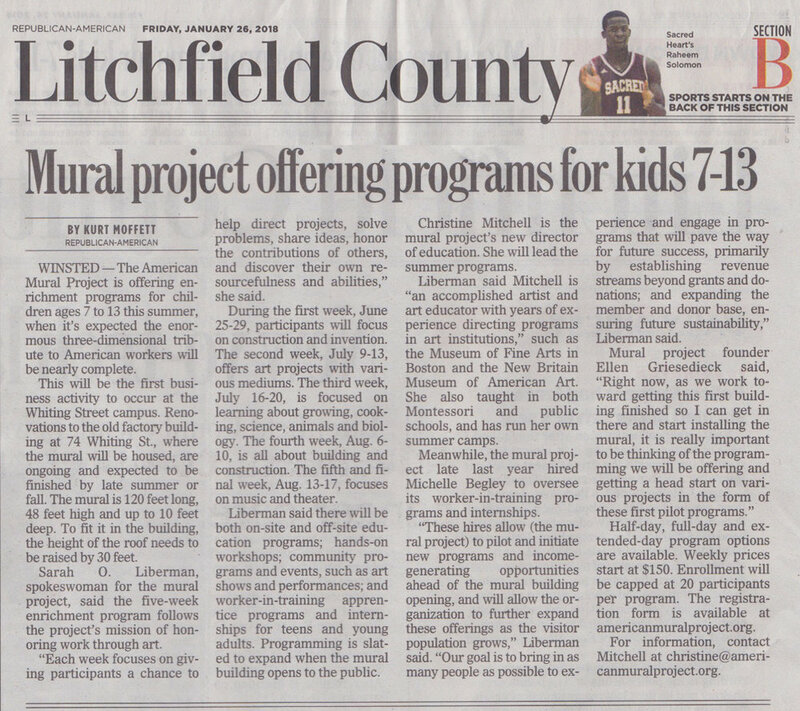 Mural Project bringing programs for kids 7-13. Click here to read the full article. Finish line in sight for American Mural Project. Read the full article here. Patrons of the American Mural Project will have the opportunity to hear the stories of everyday American workers when they tour the museum when it opens, possibly as early as next year, thanks to an internship program. The project, otherwise known as AMP, hired five college-age adults this summer to be part of an unpaid pilot 10-week internship program. They received first-hand experience interviewing people who have a wide variety of different jobs. Watch Ellen on Ann Nyberg's Network Connecticut. Click here to watch the video. This week, the State Bond Commission approved a $1 million grant to support the development of an old mill building in Winsted to house the American Mural Project. Click here to read the full article. The American Mural Project receives donation from Friends of Main Street. Read the full article here. The mural team expands. Project founder visits Winsted 4th-graders. Click hereto read the full article. Ellen was interviewed yesterday, along with Kristina Newman-Scott, Connecticut's director of culture, on WNPR's Where We Live with John Dankosky. Ellen's segment, which starts at approximately 15:00, is part of a longer interview on the state of the arts in Connecticut. Ellen spent time with Marshall Miles at the Robin Hood Radio studio in Sharon. Listen to Marshall's interview here.